After a short way along the road turn right to Crimpton Farm. A concessionary FP avoids the farmyard. After leaving the farm gate aim for the stile at the far left hand corner of the wood ahead. Go through the wood and over the ladder stile into sheep pasture. The path to Whitewell lies straight ahead. Keep to the left of Raven Scar Plantation and go over the ladder stile encountered about 100 yd before the road. Cross the road, and continue downhill. Close to Whitewell go through the gate, keep to the right of the house on Seed Hill and to the left of the stone wall of St Michael's Burial Ground. A small wooden gate leads onto the road close to the Inn. This walk is typical of some those offered in this series; a combination of a fell and a river walk. 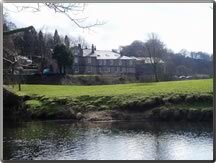 The first part of the walk from Dunsop Bridge to Giddy Bridge is a pleasant stroll through fields and park land. 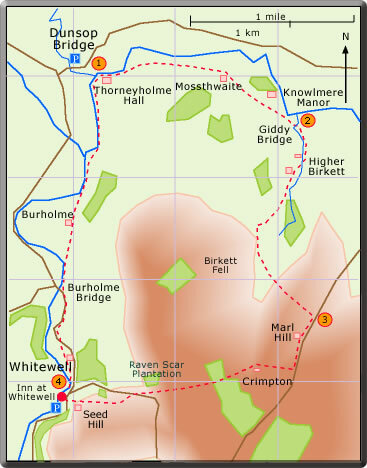 There then follow a climb past Higher Birkett to Birkett Fell and on towards Marl Hill. From Crimpton to Whitewell there is a welcome descent through pasture land and woodland. The Inn at Whitewell is a popular venue for drinks and lunches now open all day. On the return from Whitewell the narrow road can be partially avoided by using the concessionary FP found on the left. The final leg mainly along the Hodder is a not too strenuous river walk.